Time to order that Snoopy license plate! We haven’t checked in on California’s drive to issue a Snoopy license plate since Gov. Jerry Brown signed legislation to launch the effort back in October 2013, and it’s definitely time for an update. Since then, progress has been both hopeful ... and a bit discouraging. First of all, it’s necessary to understand that California’s Department of Motor Vehicles has a policy of not stamping a specialty plate until it’s ordered by at least 7,500 people. While well over that number officially expressed interest in the plate via its web site, the next phase — securing a $50 deposit from at least 7,500 of those folks — hasn’t been moving as rapidly. As these words are typed, slightly more than 5,500 people have done so. Existing DMV rules don’t allow for more than one extension, so that means a final deadline of January 2016 ... roughly seven months away. The bottom line is obvious: California’s Peanuts fans need to more aggressively promote this program to their families, friends, neighbors and co-workers. Public service has been a great selling point, from the very beginning. 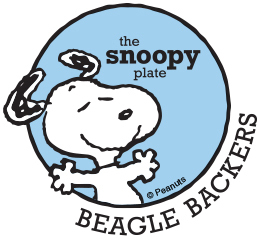 Once the sign-up threshold is achieved, every non-personalized Snoopy plate sold will give $40 to the California Cultural and Historical Endowment, which expects (hopes) to collect roughly $300,000 for California’s museums, during the first year the plates are stamped. 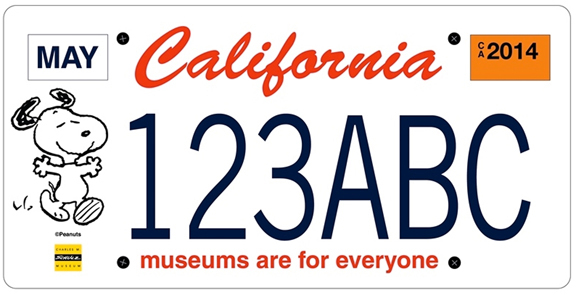 The news is even better when purchasing a personalized plate: $50 to museums, and $48 to the California Environmental License Fund. In an effort to further sweeten the deal, the program recently introduced a “Beagle Backer” bonus. The first 7,500 purchasers will become Beagle Backers, and receive one-time discounted or free admission to 58 museums throughout the Golden State. The list of participating museums keeps climbing, and the current retail value of this incentive is more than $850 ... which is a pretty sweet return for the initial license plate fee. Granted, you’d need to travel a bit, to take advantage of every opportunity ... but who wouldn’t enjoy an ambitious museum road trip? On top of which, the participating venues are an impressively varied bunch, including the California Science Center, the Japanese American National Museum, the Aerospace Museum of California, San Diego’s Museum of Contemporary Art, Los Angeles’ Museum of Tolerance, the Santa Barbara Zoo, the Western Railway Museum and — of course — the Charles M. Schulz Museum and Research Center. You can see a complete list of participants here. As of 2013, California boasted 24,390,236 licensed drivers. We find it hard to believe that there aren’t at least 7,500 eager to put a beagle on their vehicle of choice. Consider this a reminder, then: Encourage all your California Peanuts fans to stand up and be counted. Send ’em to snoopyplate.com, to sign up. As California goes, so goes the nation ... and the faster we get the World-Famous Beagle on those plates, the sooner folks in the other 49 states may be inspired to do the same!